NY May Go For Gravitas of Bill Clinton or Mario Cuomo, Not Caroline, You Know? Caroline, you know, has a really good heart, you know, and would make a great Senator from New York, you know. Except in newspaper interviews, TV shots and talks with others she sounded like a lightweight or, you know, an inarticulate jerk who has no experience or reason to be a U.S. Senator. So the Democrat Party Leadership of the State of New York has decided not to model itself after Illinois and the Nutjob Blagoyevich-Rush-Burris trio. New York is “floating” the idea of a “caretaker” senator with the gravitas of, say, Bill Clinton or Mario Cuomo. And, you know, that sound like a good idea for both New York and Illinois, you know? We here at Peace and Freedom favor a special election in most of these cases of vacant seats; but in Illinois just now the legislature rejected the idea of a special election and chose to impeach the Governor and go from there. But they ran out the clock and the Governor got the last shot off before the buzzer. 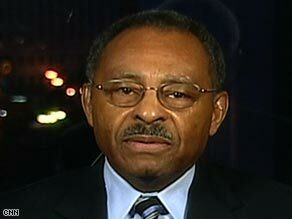 The Illinois Governor named his one-time rival Roland Burris to fill Barack Obama’s vacant U.S. Senate seat. Why do we allow such shenanigans? Sen. Bill Clinton? Sen. Mario Cuomo? Don’t completely rule it out. The former president and the former New York governor are among several boldface names being touted as possible “caretakers” for New York’s Senate seat — people who would serve until the 2010 elections but wouldn’t be interested in running to keep the job. As the process of picking Sen. Hillary Rodham Clinton’s replacement gets messier, the option may become increasingly attractive to Gov. David Paterson, who has sole authority to name a successor. A spokesman for Bill Clinton, Matt McKenna, said Wednesday that the former chief executive isn’t interested in the job and plans to continue the work of his foundation. Cuomo declined through a spokesman to discuss the Senate seat. A big name could have an immediate impact for New York in the Senate while letting the large field of hopefuls duke it out in 2010, according to three Democratic Party advisers in New York and Washington who are close to the discussion with Paterson’s inner circle on this issue. Two others in the party confirmed that Paterson is still considering the caretaker option. The advisers spoke on the condition of anonymity because they weren’t authorized to comment. The December 9 remarks by Representative Rush appeared New Year’s Eve on the Fox News Channel. Yesterday Bobby Rush strongly supported the Illinois Governor’s appointment of Roland Burris to fill the vacant Illinois U.S. Senate seat in blunt racial terms. Rush also threatened to “take this issue to the Congressional Black Caucus” if the Senate rejected Burris. Bobby Rush and Governor Rod Blagojevich are now on one side of this debate and President-elect Barack Obama and Senator Harry Reid are on the other. As for Mr. Burris and his qualifications to serve, well, at Chicago’s Oak Woods Cemetery he has erected a granite mausoleum listing his many accomplishments. Who else in the state of Illinois has a granite resume? In summary, in Illinois we have a Governor that nobody much likes, allegedly tried to sell the U.S. Senate seat and has refused all advice. Add to that a Congressman who isn’t sure what he said a few weeks ago and a nominee to the U.S. Senate with an ego and mausoleum the size of a condo. 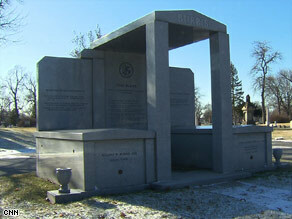 Above: Roland Burris has erected a mausoleum listing his accompishments in Chicago’s Oak Woods Cemetery. Israel sent more troops to the Gaza border Wednesday, rapidly moving forward with preparations for a possible ground offensive as the next stage of its military assault on the coastal territory’s Hamas rulers. Israel rebuffed calls by world leaders for a truce, and Hamas was cold to a cease-fire. Instead, both intensified their fire. Israel bombed a mosque that it said was used to store rockets as well as vital smuggling tunnels along the Egyptian border, and the Islamic militants hammered southern Israeli cities with about 60 rockets. Israeli troops trudged between dozens of tanks in muddy, rain-sodden fields outside of Gaza, assembling equipment, cleaning weapons and scrubbing the insides of tank barrels. Their commanders moved forward with preparations for a ground operation, said an Israeli defense official who spoke on condition of anonymity because of the sensitive nature of the information. The U.N. Security Council scheduled emergency consultations Wednesday night to discuss an Arab request for a legally binding and enforceable resolution to ensure an immediate cease-fire in Gaza. Egyptian Ambassador Maged Abdelaziz said he was on instructions from Arab League foreign ministers who met in Cairo. Diplomatic efforts by U.S., European and Middle Eastern leaders appeared to be having little effect. A French proposal for a 48-hour cease-fire to allow humanitarian supplies into Gaza failed to gain traction. Israeli Prime Minister Ehud Olmert said the time was not ripe to consider it. A separate proposal by Turkey and Egypt, two of Israel’s few allies in the Muslim world, also seemed to be attracting little serious study in Israel or Gaza, where Hamas has also dismissed talk of a truce. With a shrinking number of targets to hit from the air and top Hamas leaders deep in hiding, a ground operation seemed all the more likely. In five days of raids, Israeli warplanes have carried out about 500 sorties against Hamas targets, and helicopters have flown hundreds more combat missions, a senior Israeli military officer said on condition of anonymity in line with military regulations. British singer-songwriter Amy Winehouse has been summoned to appear in a Norwegian court on Jan. 12 in her appeal against a fine in a drugs possession case, a police prosecutor said Wednesday. Winehouse and her husband, Blake Fielder-Civil, were arrested in the western city of Bergen in October 2007 during a concert stop on charges of possessing 7 grams (1/4-ounce) of marijuana. They were held overnight and released after paying fines of 3,000 kroner ($415) each. The 25-year-old Winehouse later appealed the fine, claiming Norwegian police made mistakes in the case. An initial trial date in March 2008 was postponed at the request of her attorney. Police prosecutor Rudolf Christoffersen says the star and her husband had been informed of the date by British police and will probably have to appear in person in the Bergen appeals court. Winehouse’s Norwegian attorney, Ole Kvelstad, has said that payment of the fine amounted to a guilty plea, which he said could have serious consequences if she sought to enter the United States. Winehouse was denied a U.S. visa this year when she wanted to perform at the Grammy awards ceremony. In appointing veteran African-American officeholder Roland Burris to the Senate, embattled Gov. Rod Blagojevich has done more than just flout the will of the Illinois establishment, the Senate and President-elect Barack Obama. With one stunning and politically exquisite act of defiance, he audaciously reasserted his authority and designed a trap that his opponents cannot easily sidestep. Just days ago, as a result of criminal charges lodged against him in connection with the alleged attempted sale of the Obama Senate seat, it appeared that Blagojevich was boxed in, destined to leave office in disgrace with only the timing of his departure in question. The state’s attorney general sought to have him declared too incapacitated to serve. The Legislature was moving inexorably toward impeachment. Blagojevich’s attorney said the governor would relinquish the responsibility of making the appointment if a special election was held instead. But in a gambit as unexpected as it was politically shrewd, the seemingly powerless two-term Democratic governor suddenly turned the tables by picking a candidate whose stature and background…. Lincoln may be turning over in his grave. Former Illinois Attorney Gen. Roland Burris was appointed to fill President-elect Barack Obama’s vacant U.S. Senate seat yesterday. When you say things that are bizarre and have never been said by sane men before: watch out. A cast of players in this sad comedy doesn’t know that…. A former Dean of the Harvard School of Law told us: ” innocent until proven guilty rarely applies to stupidity, a crime without a statute of limitations”…. Barack Obama’s Senate Seat Not Post-Racial? Barack Obama must be thinking that as he lines up his putt today in Hawaii. Because Barack Obama is suffering just from knowing the Governor of Illinois and Congressman Bobby Rush of Illinois today. These are the kind of wingnuts that makes one wonder…. Barack Obama doesn’t need this, not right now. Already, Obama’s Hawaiian vacation has been interrupted by news of an Israeli incursion into Gaza. He faces a mounting economic crisis even before he takes office. And now, just as Obama was starting to distance himself from the machinations over filling his Senate seat, Illinois Gov. Rod Blagojevich’s surprise pick is dragging him back in to the home-state mess – along with the kind of hard-edged racial politics Obama tries to avoid. Blagojevich, who has been charged with attempting to sell the Senate seat, announced Tuesday he was tapping Roland Burris, the first African-American to win statewide election in Illinois and the closest thing in the state to a black elder statesman. But Obama is backing efforts led by Senate Majority Leader Harry Reid (D-Nev.) to block Burris, saying Blagojevich is too tainted by corruption charges to make the pick. In this Aug. 17, 2005, file photo Sen. Barack Obama, D-Illinois, left, laughs with Illinois Gov. Rod Blagojevich during Governor’s Day at the Illinois State Fair in Springfield, Ill.
It’s not clear Reid can block Burris. But Obama’s bigger headache could come from a longtime South Side congressman and one-time rival – Rep. Bobby Rush – who is unmistakably daring officials not to block the ascension of an African-American to replace Obama. A militant arrested in Pakistan has confessed involvement in the Mumbai terror attacks and is giving investigators details of the plot, a senior Pakistani government official said Wednesday. The revelation could add to pressure on Islamabad to either bring Zarar Shah and other suspects to trial or extradite them to India. The official spoke on condition of anonymity because of the sensitivity of the topic. A senior intelligence officer said Shah and another suspect, Zaki-ur-Rehman Lakhvi, were cooperating with investigators, but cautioned authorities had not reached a definite conclusion as to their involvement yet. He too asked for anonymity. Indian officials were not immediately available for comment. Gunmen targeted 10 sites including two five-star hotels and a Jewish center during the November siege on Mumbai‘s financial capital, killing 164 people in a three-day reign of terror. India and the United States say the militants who planned and carried out the attacks were Pakistani and are demanding Islamabad take action against those responsible. The official also told The Associated Press that India has shared some evidence of its suspicions but he said it was “very very little.” Pakistan’s president and other top officials have said India has yet to provide any evidence. As Arab rockets reach ever deeper into Israel, they may be weakening what for years has been a cornerstone of Mideast peace efforts — an exchange of land for peace. Israeli hard-liners have long warned that any territories Israel vacates will be used to attack it. They can now point to the Hamas missile that slammed into a bus stop in this port city Monday, killing a 39-year-old woman. It was fired from the Gaza Strip, which Israel gave up in 2005 and is now ruled by Hamas militants who reject the very existence of the Jewish state. Even in the midst of the war, many Israelis still argue that a peace deal with the Palestinians, which would require a withdrawal from virtually all the West Bank, is Israel’s only real security guarantee. Foreign Minister Tzipi Livni, in defending the Gaza offensive in a speech to parliament Monday, said Israel remains committed to the idea of a Palestinian state alongside it. Yet the missile that hit Ashdod, a city of 200,000 people, drove home a grim new reality for Alin Ben-Yosef, 32, who fled to Tel Aviv for the night with her two young daughters after Ashdod was struck. Egypt has cancelled official New Year’s Eve events in solidarity with the suffering of the Palestinians being “massacred” in Gaza, the state-owned Al-Ahram daily reported on Wednesday. “In solidarity with the painful events in the Palestinian territories and the massacres which Gazans are faced with … the ministries of culture and information have decided to cancel New Year’s festivities,” the paper said. Cancelled events include a special concert by famed Egyptian singer Mohammed Munir set to be held at Cairo’s Opera House and a variety performance hosted by the ministry of information due to be broadcast on state television. Dubai’s opulent, multimillion-pound New Year’s Eve celebrations have been cancelled due to the Gaza violence, leaving hordes of expatriates hastily making alternative plans. Sheikh Mohammed bin Rashid Al Maktoum, ruler of the Gulf state, called off festivities late last night. He said “all public New Year’s celebrations” should be stopped “in solidarity with the Palestinian people, who are currently enduring death, suffering and destruction in Gaza”. The city, home to thousands of Western expatriate businesspeople and tourists, usually holds spectacular public firework displays and open-air entertainments worth millions. You are currently browsing the Peace and Freedom Global Future blog archives for December, 2008.